The story of how an Iranian woman has scaled the corporate and social ladder. There are reports here and there about the shining presence of Iranian scientists in international circles and the success they have pulled off in science and research, but when it comes to air transportation few people know that the first woman who got a Ph.D. in aerospace is the very person whose invention in college years made her Iran’s top student of mechanical engineering. 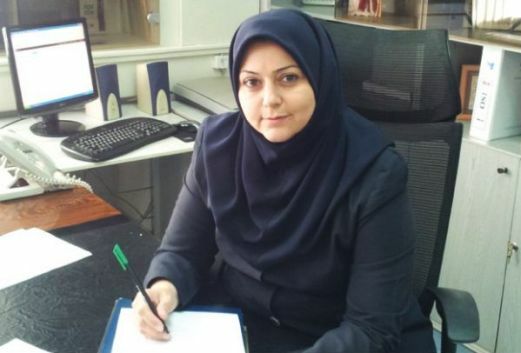 Today she is the director of Training and Human Resources Development at the Iranian Civil Aviation Organization, head of Iran Air Aviation Training Center, deputy managing director of Iran Air, and a legal expert who arbitrates disputes among airlines. She is also a professor at Amir Kabir University of Technology and Shahid Sattari University of Aeronautical Engineering. How come you developed an interest in this field? Basically, a child’s character forms at an early age, between 10 and 12, when s/he faces questions about their future job. When I was a child I would repair home appliances on the fritz. My family provided me with the opportunity to learn through trial and error. I could fix all devices […] and I was very much interested in technical issues. That I could repair the vacuum cleaner prompted my parents to call me “The Engineer” at home. I started with simple things. I was always an active student in school and took extracurricular courses. When I was admitted to university, I wanted to change the world. […] As a young girl, I used to buy tools I needed for my studies instead of what other girls would purchase. I used to sit up to study and at times I would stop reading only after hearing the call for morning prayers. […] I was admitted to Sharif University to study shipbuilding. Right then mechanical engineering had two subdivisions: aerospace and shipbuilding. The latter was not all that popular among women because its job prospects were dim. What was the focus of your undergraduate thesis? I chose a scientific topic and went so far as building a plane wing. It turned out to be a good one. […] I built the parts needed for the plane wing all by myself; I tried to learn machining because I wanted to build it all by myself. It was not easy to make a part. Thanks to my thesis, I finished first in mechanical engineering in Iran. […] It all happened when I was pregnant with my first child. Wasn’t it difficult for you to continue as an expecting mom? When PCs made their debut in Iran, I had to buy a computer to keep pace with the world’s latest technologies. We weren’t well-off. Instead of buying the items I needed for the coming baby, I bought a PC. It was when I was hired by Iran Air. […] There we were trying to make something to cushion the blow of landing when the plane touched down. My first kid was 40 days old when I started my master’s program. Later I became a Ph.D. student in Sharif University. I never skipped class. I attended my first class two days after I gave birth to my second kid. That day when I arrived late, the professor asked where I had been. “I just gave birth to a kid,” I answered. They couldn’t believe their eyes. Normally a woman stays home ten days after delivery. But it was not the case with me. What did you work on for your Ph.D. thesis? I studied aircraft structures for MS. I pursued my studies in fracture mechanicsat the PhD level. It deals with a part when it breaks as a result of aging. I picked that since I was working at Iran Air and I could see firsthand that the planes were aging. I wanted to solve this problem. When I proved the math equation, I was told that I couldn’t release it in Iran and I had to have an essay released through the Institute for Scientific Information (ISI) before getting my Ph.D. I was also told I had to find a foreign professor to register the equation under his/her name. Earlier I had sent an essay to England where a gentleman released it in his own name! I didn’t want to repeat that experience. I had bad feelings because nobody supported me and I was about to miss a deadline to complete my Ph.D. program. I couldn’t register the work under another person’s name either. Finally I found a place in England which accepted to assess the essay for £600. My husband paid for it and my essay was accepted. When I arrived at the conference hall having the Islamic covering on, all participants surprisingly asked me, “Have you come from Iran?” and I said yes. They didn’t expect to see me there. An Israeli man who was a full professor was in the front row. He would ask anyone presenting their article two very difficult questions. I solved the math problem to the best of my knowledge and ended my speech on time. It earned me an almost one-minute standing ovation. When I was asked what my final words were, I turned to the Israeli man and told him that I was ready to answer his questions, if any. “No need for that since everything was perfect,” he said. I felt a sense of pride for the honor I had earned for my homeland. Do you write poems too?